CAUTION... THERES MORE THAN 75 PICS ON THIS PAGE, DAIL-UP BE PREPARRED. Be patient with me as there is a lot of pics and info to put up. I am going to try to keep most of the pics on the first page, for this part of the build. I will still have some mods to finish though out this year. So stay tuned for more craziness. Grab some popcorn and lube, see what happens. 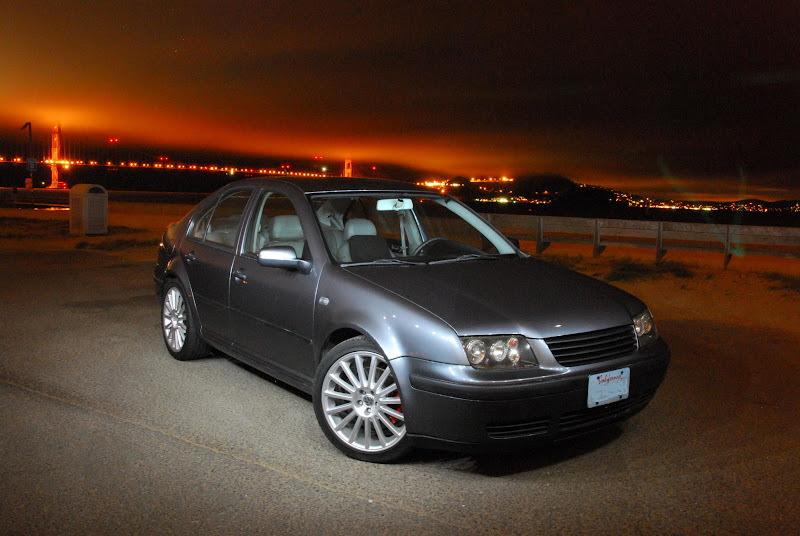 Project starts with a 2004 Jetta TDI I have owned since 10/04. I bought it with 3500 miles on the clock. I had intended this to be my daily driver. Well that was a while ago. Once I started changing things, it only took a year before I started this project. I had started buying bolt-on products, but I was not impressed with fit, quality, and performance. So I decided if I wanted to do something the only way I would be happy was if I did it all myself. 1/09 I bought the PD150 head for $300 and sent it off to get ported, figured since my timing belt was about due to be changed I would just swap on the 150 head at the same time. That was a great idea, until I found the turbo and intake 2/09. I wasn't sure how I could get time to build everything, but started planning the header design. I spent a couple months planning and figuring out how the new system would fit and function. 5/09 I met with Bora parts and started talking about parts and availability. I started thinking about more power vs. the bottom end. 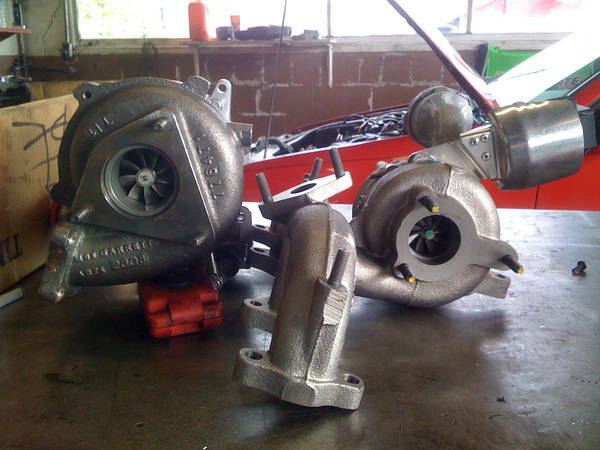 Then more power vs. 02J 5 speed. Since I am the type of person that likes to do things once, I decided to do a full rebuild with Rosten rods and the 150 head. Of course it didn't stop there, 6/09 I was offered a new set of BHW 2.0l pistons for $220ea. I decided that I could do that as well, too good of a deal to pass up, they retail for $378 a piece. Now everything starts to snowball. I found a local member that was looking for a complete performance setup. 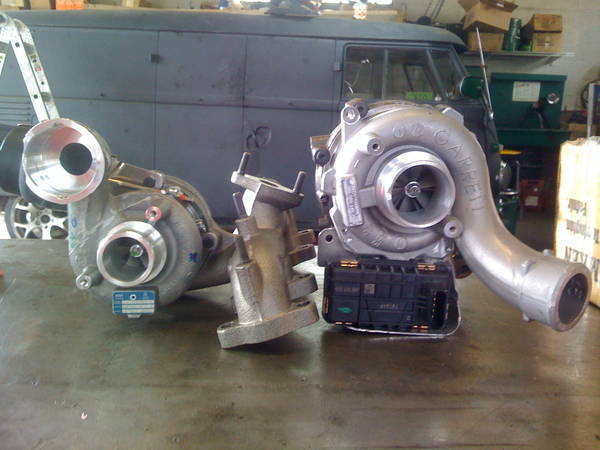 I was able to sell my old turbo, Boost Factory SMIC, custom I/C piping, intake manifold, TIP, transmission, DC st3+ clutch, Peloquin, etc. in one fail swoop. This opened up the 6 speed conversion option, so I called Bora Parts and had him set me up. They had not made it to the US yet but were arriving shortly. 09/08/09: Engine dropped off at machine shop. 11/15/09: The car started and drove again. A big Thanks goes to Rich and Marcell of FIXUM HAUS, my car hung out in their 3 bay shop for 4 months. There is no way I could have done this without them. They are some of the best TDI mechanics in the PNW and beyond. 248whp / 433wtq 14.27 @ 100.7mph "still not done"
Last edited by O.C.TDI; February 1st, 2010 at 22:11. Here it is next to a stock BEW KP39. I think it is just a bit bigger. What do you do once you get a new toy??? Here is a shot of the newer generation VNT mechanism. 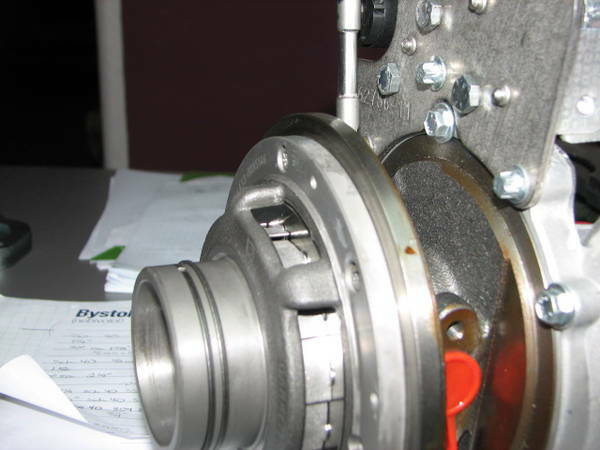 This style VNT allows for infinite clocking of both the turbine and compressor housing. No need to drill/index the vnt since it isn't connected to the housing. 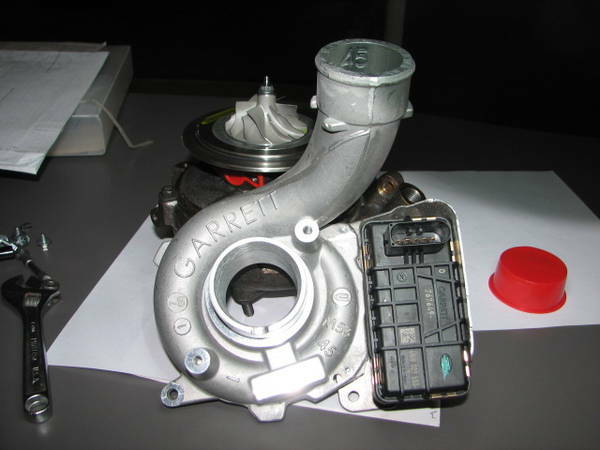 The downfall is that this turbo come from the factory with an electronic actuator, that has to be switched to a vacuum model. Pretty easy. Change the vane lever to one from a vacuum style turbo, and re-mount the vacuum actuator to the GTB. Cutting and welding required. Last edited by O.C.TDI; January 3rd, 2010 at 16:22. Here is the first mock-up of the header. It is made from 1.25", sch40, 304l SS pipe. Flanges are .5" mild steel. I used 12-90* ell, 60" of 1.25" pipe and the two flanges to build this. I know sch 40 pipe is way overkill for this, I went this route to keep velocity up. The I.D. matches my flanges and head. I know .065 wall would work. But I like to be difficult. This is were I oriented the turbo flange to the head flange. It took me a couple attempts to get it right. Once the orientation was set we started cutting and tacking it all together. This Euro SDI intake manifold provides its own challenges. It has much longer bolts than a pd150 intake, and takes up a lot more space. Special attention to bolt access was very important in building this piece. You can see the extra 90* to hold the flange in place while fitting up. All tacked up and ready for a test fit. We knocked this out in about 6hrs. Here is the first fit up in the car... It fit. It was tight but it fit. After we had the design ironed out, we went to our welding shop and cut it all back apart. The shop that my car was at was not really setup for the welding we needed to do. Everything was marked, cut, prepped, and tacked back into place. This ate up a bunch of time. Since I do not have a shop of my own, I could not do everything the way I wanted to the first time, but when people let you use their shop and tools, its hard to complain. We got it all together and started welding it out, until we ran out of argon... Some reason we couldn't find a weld supply house open at 2:00 on a Sunday morning. Last edited by O.C.TDI; January 3rd, 2010 at 18:20. I would like to thank Harry the owner of the shop we did our welding in. He builds custom speedway/flat track motorcycles, and has set himself up with my dream shop, it was an honor to be allowed to work in such a fantastic facility. Once we got our Argon we were set. We cut each primary off and welded them out. Each weld has 3 passes, fully back purged. Smoothed the inside and bead blasted it. With all the primaries back in place we built the spike. This keeps the volume of the primary constant until it merges with the adjacent cylinder. Welded out and cleaned up. After some time in the blast cabinet. Last edited by O.C.TDI; January 4th, 2010 at 09:24. The last bolt up before ceramic coat and engine assembly. The next two pic show how the compressor outlet was modified. Now on to the FMIC... I based my design off of Allards PD150 FMIC kit. I fell in love with its short pipes. This is the core I started with. Core is 24"x11"x3" with 2.5" inlet/outlet. As you can see here. I cut one of the end tanks off and flipped it over. Cut off the original inlet and sealed it up. 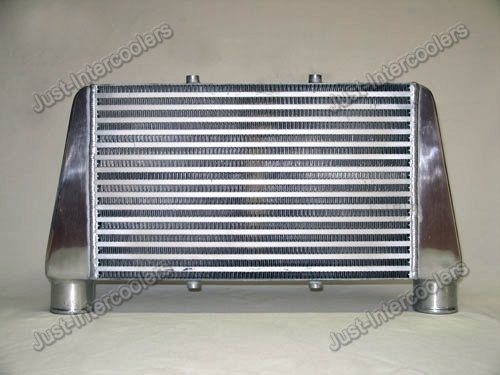 I used an aluminum 90* cut back to flow into the intercooler. My radiator has been shimmed back 1.25", this I/C sits where the radiator used to sit. This shows the bend into the I/C and old inlet. After everything got welded out and a MAP sensor bung installed. I took it back to the car for fit up. I also trimmed .75" off the back of the crash bar. Everything bolted in place. At this point I was at a stand still on the I/C until the engine went in. I wasn't sure if the inlet would clear the bumper the way it is shown in the pic. A shot of some of the trimming needed to get the piping through the core support. Last edited by O.C.TDI; January 4th, 2010 at 20:07. There are limited pics of the engine build itself... I am not one for taking pictures while I work and didn't think about it til it was assembled. The basis of this rebuild was to prevent catastrophic failure down the road. The engine had 95,000 mile on it. It was in perfect running condition. The camshaft had typical PD lobe wear, it probably would have lasted another 10-20k miles. New oil pump, timing belt kit. Crank was checked, measured, polished, then balanced. Balancer, flywheel, and pressure plate were balanced to match. Pistons were not modified. I could not make that happen in my time frame. After blueprinting we came up with a compression ratio of 18.4:1, most of the drop was from the BHW pistons alone. I would have liked to have dropped a bit lower, but it is better than stock. Here is the head after preliminary porting and surfacing. Note that this is not what the finished ports look like. Porting was done locally by a Porsche speed shop. The intake was mildly ported and port matched to the head. I didn't want to put too much energy into this intake because I was still unsure if I could make everything work together. I will probably play with it a bit more as time goes by. Rear main, 240mm flywheel, DC stage 3+ were mounted to the engine, from there it was mated to the Bora Parts DRW 6 speed and rolled back in the car. The DRW conversion was pretty straight forward, the kit was nice and complete. Last edited by O.C.TDI; January 8th, 2010 at 23:55. 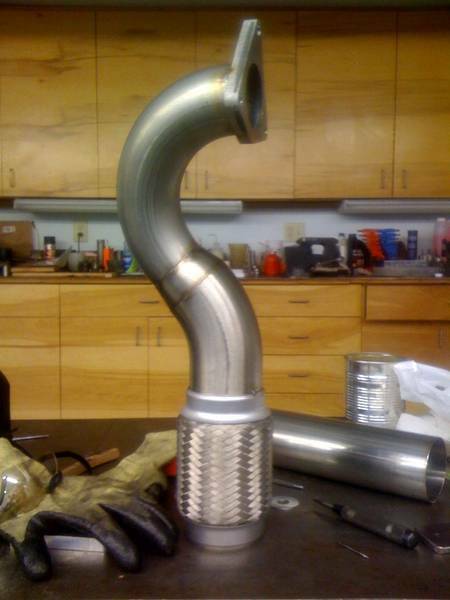 With the engine and trans back in the car, it was time to move to the weld shop and work on the rest of the piping. I/C piping is 2.5" .065" wall stainless. Yes overkill, I know, its my thing. Here is the mock-up of the lower I/C pipe. I ended up cutting my I/C inlet back a bit. I didn't like how the bumper fit, pic below shows the difference. Custom ports for boost gauge, etc. Shot of intake with anti-shudder valve, ie the best racepipe ever and it has the same plug as the stock BEW asv, I had to re-wire it, but it is fully operational. Clearance between Evo skid plate post and piping, yes its tight but that section of pipe does not move. Last edited by O.C.TDI; January 3rd, 2010 at 20:35. A shot from underneath, with everything in it's place. The sag in the lower valance is not from the I/C, its from sitting in the garage for over 3 months. Here you can see where I ended up changing the piping as mentioned above, I fit the bumper with the longer inlet and had to trim a lot of bumper. I decided I did not tlike the way it fit, so it was shortened and a dbl. 45* offset replaced the silicone 90*. With the current setup I would have barely trimmed anything off at all. It starts with 2.5" .065 wall stainless, after 135* it increases to 3" and runs the rest of the way out. I tried to run a full 3" d/p but had to cut the 90* off tangent to get it to fit, I don't like cutting of tangent. So I decided this was the best route for me. Currently the exhaust is 3" to the axle, and 2.5" over it. I did not have the muffler I want, so I will finish that up this spring. Last edited by O.C.TDI; January 3rd, 2010 at 20:56. All of the welding for this project was done by a good friend of mine, Justin, he also has a TDI. I could not have done any of this without him, and his families support. Thanks Justin. Here he is welding out the 3" TIP, it looks long in this pic because there is a length of pipe tacked on the end of it to help with back purge. Here is an end veiw of the filter element. Looks like corrugated cardboard. Here it is all split apart. There is a secondary safety filter in the back of the housing, It is used to keep dust out of the inake tract while changing filters. The main filter is about 8" long. There is probably 2-3 stock TDI air filters in this one. The inlet end of the housing has a large particle ejector, with a vacuator valve. Everything mounted in the car. The glow plugs are not hooked up at this time, during this build the ceramic recall came out. I had already bought the steal plugs, but did not have the flash for them yet. The flash has been taken car of now. The gray PVC canister is my temporary vacuum ball. I call it my ghetto bling. A shot from the other side. Last edited by O.C.TDI; January 4th, 2010 at 20:37. I am saving this post for a few of the final details, ie. battery relocation, skid plate/side skirt, etc. Last edited by O.C.TDI; January 4th, 2010 at 09:19. Amazinggggggggg. I want to do this to mine soon! Where did you get the head from? How much to port? Good work dude! It looks very well thought threw and well done. Congrats on all the work you have accomplished and the great results. Your car is one of a kind.... Congrad!!! Have you dynoed her yet?